Smart Relief offers powerful, portable relief of back pain by bringing TENS technology to pain sufferers in a convenient, affordable way. FDA approved for relief of chronic pain associated with arthritis. TENS (short for Transcutaneous Electrical Nerve Stimulation) blocks the body's pain signals by sending gentle electrical pulses along the nerve, which reach the brain before the pain signals do. Smart Relief is safe, FDA approved, easy to use with no wires, no assembly and no prescription needed. 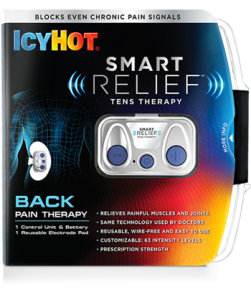 Icy Hot Smart Relief Tens Therapy Starter Kit includes a control unit, 3V battery, reusable electrode pad and a user guide. Easy to use, no wires, no assembly, no doctor needed. The electrical pulses of Smart Relief are generated by a small, battery-powered device. It's remarkably small - only half an inch thick and smaller than a credit card. It easily snaps onto an adhesive patch, and activates two small electrodes that pass the gentle electrical pulses through your skin and block your pain. It provides the same type of TENS relief you find in physical therapy facilities. Smart Relief takes pain relief to a whole new level - 63 to be exact. You can easily raise or lower the intensity level to customize the relief you need. Just turn on Smart Relief, and turn off pain.